Mary Anne Robbins and my partner Tony Bainbridge, 1 dog a sprollie called Lilly (she has her own fan club, thinks it is her job to meet and greet everyone along the canal) 2 cats called Marmite & Benny who have adapted very well to boat life. Tell me a little about yourself and why you decided to live a life afloat. We were renting a house, worrying that when we retired we wouldn’t be able to afford it and fed up with landlords putting up the rent, not fixing boilers etc. Tongue in cheek I said to Tony ‘how about living on a boat’ expecting him to poo, poo the idea. I had a narrow boat many years ago for holidays and weekends, and had worked on the hotel boats in France. 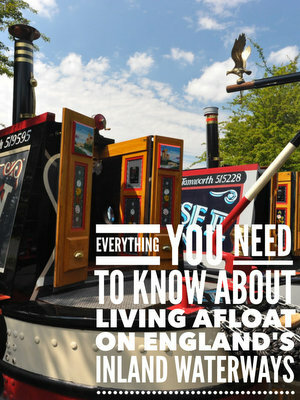 Tony had never been on a narrowboat before except for a drunken day trip with friends! Well he was up for it and the rest as they say is history. Yes, we were very lucky. After looking at adverts and not really understand the BW system for applying for a mooring. I made 3 phone calls to different boat yards (they weren’t advertising) and just asked! 2 calls went to answer phone and I left messages, but no one got back to me (surprise) the 3rdto call me when he got in. Thought that would be the last I heard, but 10 mins later he returned the call, we had a chat, he told us to come and have a look and the deal was done. It was only after living on the boat that I realised how lucky we had been, up till then I thought people had been exaggerating how hard it was to get a mooring. We are moored near the dry dock at Bulbourne; there is water and electricity available. Parking for the car is across the lock and a short walk away. People are friendly and the lads in the dry dock are very helpful, think they have had a few laughs about our inexperience! But I supply them with tea bags and milk when they run out so it works well. Just over a year, we have survived one of the wettest summers and longest coldest winters and are still smiling! An unsecured personal loan each, the repayments are a lot less than the rent on a house was. Tony works as a carer looking after Altsimers patients. I have my own business which I run from the boat. 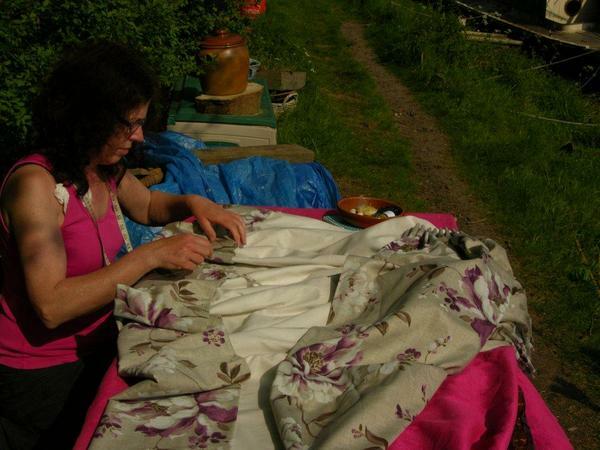 I teach sewing and run clubs in local venues, also have a mending and alterations service. Not having hot running water. The lifestyle, meeting friendly people. Would love to have a wide beam. With us both working, my elderly mother and pregnant daughter living in the area we don’t cruise much, but we bought the boat from Great Haywood and cruised to our mooring. We restocked at shops that were close to the canal. We have a washing machine on board, wouldn’t have bought the boat if it didn’t have one. Cassette, it is ok, in the snow we had to take it on a sledge to the emptying point at Marsworth! Sometimes think a pump out would be good, but we would have to do 7 locks there and 7 back to use the pump out. 3 using my phone as hotspot, it is ok a bit slow at times, but when they say all you can eat data they mean it. Warmer than a lot of houses I’ve lived in, unless the wind was in the wrong direction. We have a Squirrel stove with 3 radiators. You must be an outdoors sort of person, with a sense of humour. Research the boat and how it all works, each boat is different and we didn’t know enough. But we are both glad we moved onto the canal. So just do it! You can visit Mary Anne’s sewing site here.